- added work in progress Nuveau 2D driver for GeForce video cards. 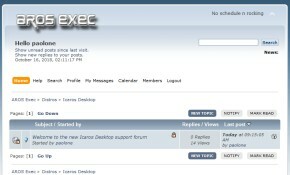 Icaros Desktop 1.2.2 is free and you can download and use it with no additional costs. Anyway, if you like it please donate: best donors (30 euros or more) will receive a ready-made Icaros Desktop USB stick (2 GB size, with a 512 MB FAT partition already made for data exchange with other OSes). This is a very "limited offer", only 8 samples are still available. Boot from USB pendrives works only on motherboards and laptops already supporting boot from USB devices in BIOS.